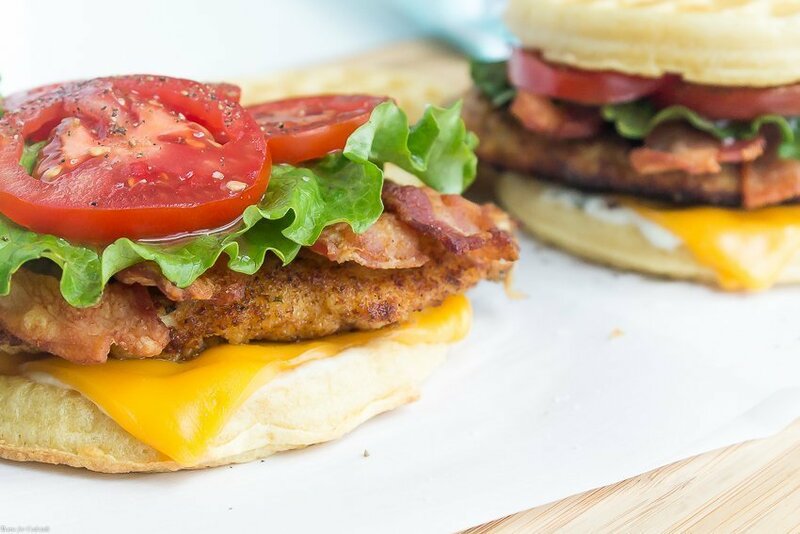 These Chicken Bacon Ranch Waffle Sandwiches are the perfect breakfast/lunch/dinner mash-up with tender, ranch breaded chicken, crispy bacon, and melty cheese. Top with fresh lettuce and tomato, plus a dreamy, creamy ranch mayo for a sandwich that is out of this world! As you know, Paul and I are staying in a hotel for a few months until we learn more about Columbus. So far we have experienced some good, and not so good, aspects of hotel life. Random fire alarms going off early in the morning is a definite con, but our little kitchenette is a pro all the way. There is just enough room for small appliances, like my toaster, to help make creative meals. It reminds me of our military days, cooking in a cramped barracks room! 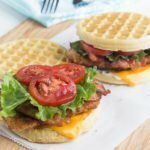 I rarely buy bread, but we always have Kellogg’s® Eggo® Homestyle waffles in the freezer, which is how my Chicken Bacon Ranch Waffle Sandwiches were born! They are a little bit homemade, a little bit tasty convenience, and the kind of sandwich you will dream about for days folks. 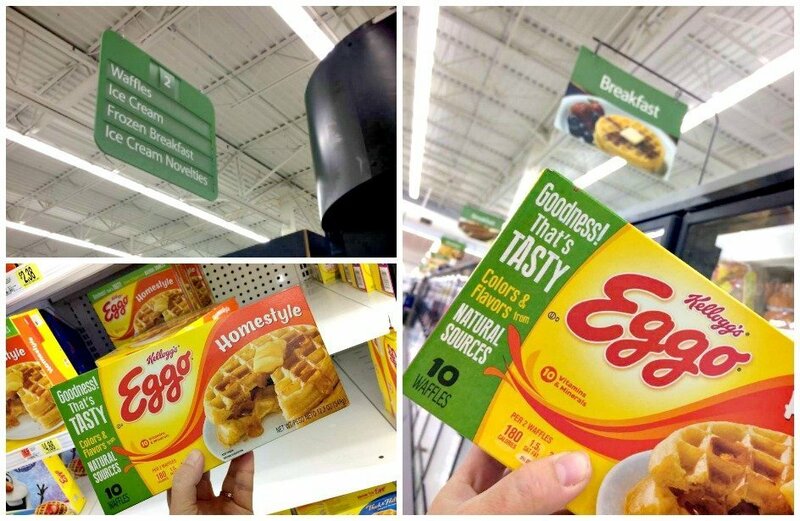 We love that the full Eggo® product line at Walmart now have colors and flavors from natural sources. These waffles are just like the ones we make at home, only they make them on really big waffle irons. They are the perfect thing to take a plain chicken sandwich, or any sandwich for that matter, and turn it into something magical. 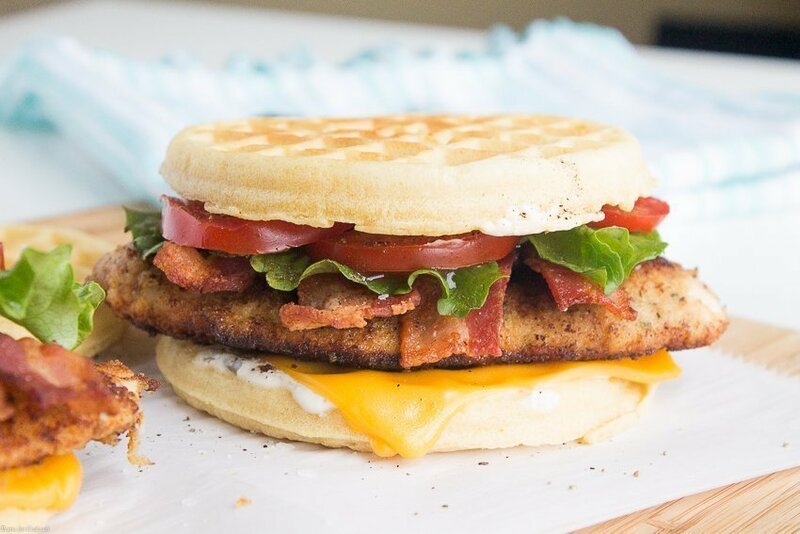 The chicken in these Chicken Bacon Ranch Waffle Sandwiches is anything but plain though. Paul pretty much said it was the best chicken I’ve ever made, and while that might be a little bit of a stretch, it isn’t too far off. The trick is in the breading folks. I added ranch seasoning to the bread crumbs, AND the egg mixture! You could make this recipe a little leaner by skipping the breading, just toss your chicken breast in ranch seasoning, then grill them up. If that isn’t enough for all you ranch-lovers, I added a creamy ranch mayo to the sandwiches too. But this gal cannot live without some fresh veggies to balance everything out. So we topped them with lightly dressed green leaf lettuce and fresh tomatoes. A pinch of salt and pepper really helps bring out the flavor of your produce. Now when it comes to the cheese, go with your favorite. I like a good quality deli American cheese, because it melts so well, but pepper jack or even Provolone would be delicious too. See how it just wants to drip right off the sandwich. 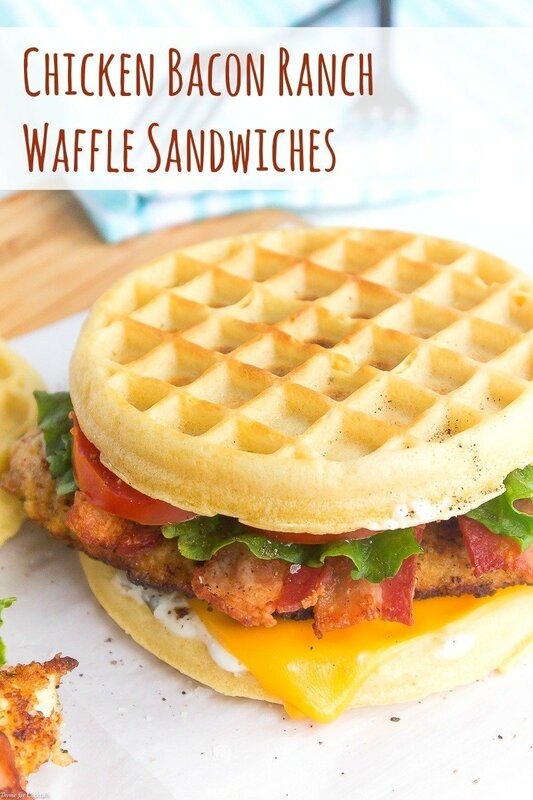 There really are so many different ways to you can use Eggo® waffles to jazz up your favorite sandwich. Just imagine the sweet and savory combo of Eggo® Thick & Fluffy Cinnamon Brown Sugar waffles and barbecue pulled pork. Makes me drool a little bit folks! 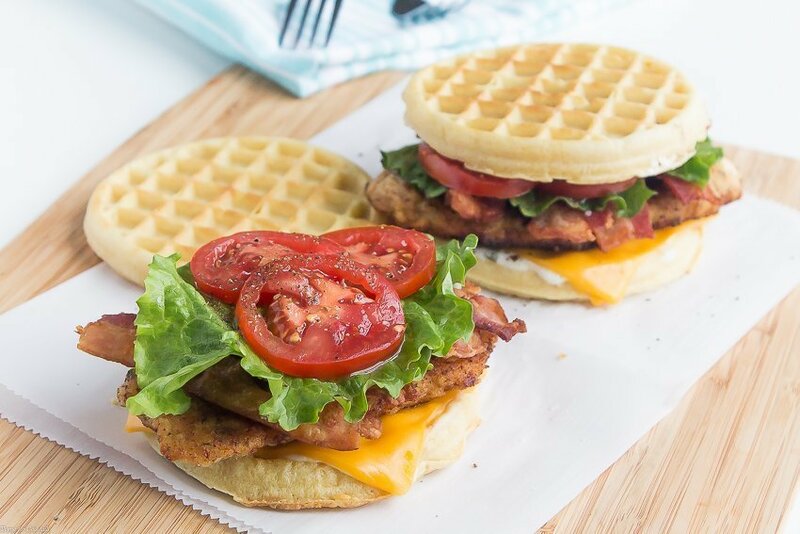 How can you use Eggo® waffles for a fun spin on your favorite sandwich? 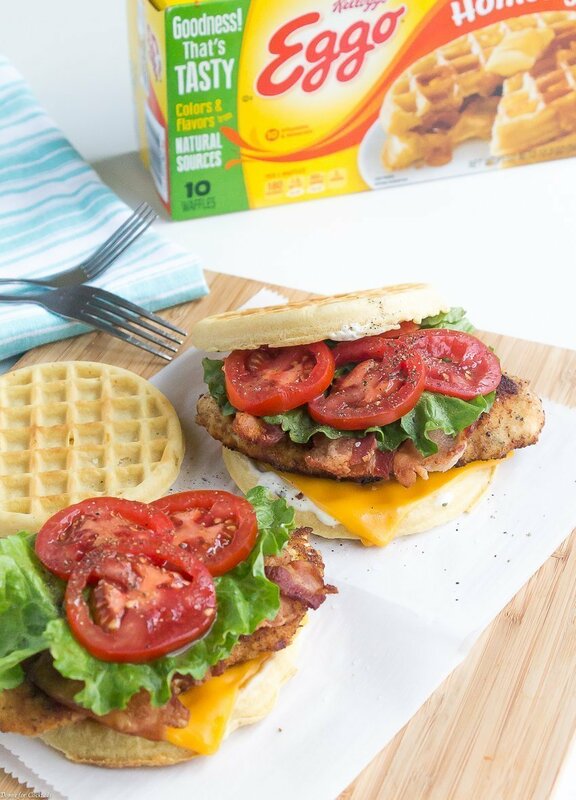 Earn $2 when you purchase ONE Eggo® Breakfast Sandwich, Bacon or Sausage varieties only, 8 ct. box only at Walmart. Prepare waffles according to package directions, set aside. Heat a large non-stick skillet to medium heat. Cook bacon until desired crispness. Set aside on a paper towel lined plate. Drain excess bacon fat from skillet, leave 1-2 tablespoons. In a baking dish mix together bread crumbs and 1/3 packet ranch seasoning. In a separate dish, whisk together egg, sour cream, 1/3 packet ranch seasoning, and milk. Dip chicken breast in egg mixture first, then coat in bread crumbs. Add to skillet. Repeat with 2nd piece of chicken. Cook 3-4 minutes on each side until done. Set aside to rest 2-3 minutes. In a small bowl mix stir together mayonnaise and remaining ranch seasoning. 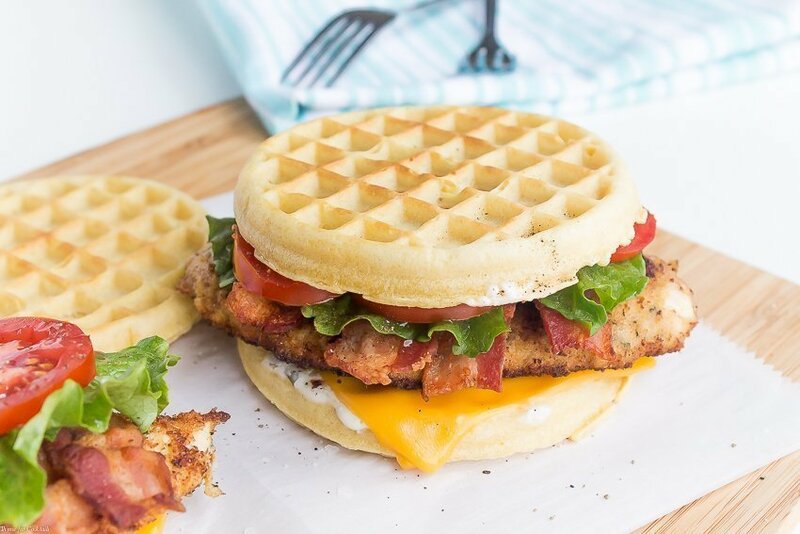 Build sandwiches by spreading 2 waffles with ranch mayo, top each with cheese, a piece of chicken, and 4 slices bacon. Layer on lettuce and tomato, light salt and pepper vegetables. Top with remaining waffles, serve immediately.